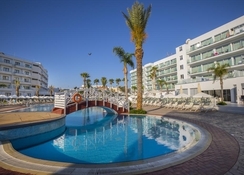 It’s not hard to have made memories that will last a lifetime when heading to the beautiful island area of Protaras and the Tsokkos Protaras Beach Hotel makes for a great family-friendly hotel from which to start making those memories. 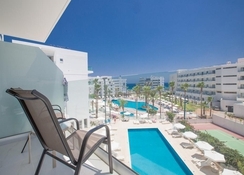 You’ll find well-equipped and finely furnished rooms that are clean and comfortable with a private balcony so you can soak in lots of that great Cypriot sun whilst taking it easy in your room. A wealth of great dining experiences await you both in and around Tsokkos Protaras Beach Hotel. Sample excellent Mediterranean food and one of the traditional tavernas or at the main hotel restaurant as well as restaurants serving classic dishes from all over the world. Great fun can be had at the Ocean Aquarium or the unique Magic Dancing Waters Live Show that will have adults and children in awe. 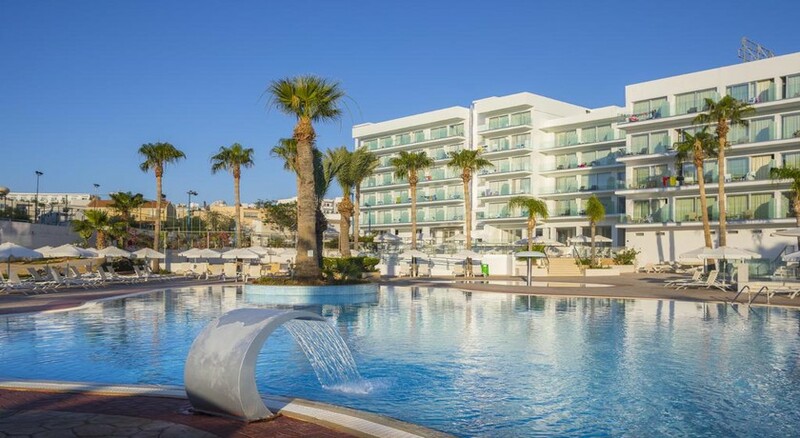 You will also be just a stone’s throw from one of the best beaches in Cyprus, Sunrise Beach. Visitors to this part of Cyprus will find Tsokkos Protaras Beach just 70km from Larnaca International Airport. Its idyllic coastal spot puts it right by the beach, which is a mere 150-metre walk. Guests will find a great choice around the hotel when it comes to restaurants and bars, many of which are conveniently found along the main Protara Road. Some retail and souvenir shopping can also be found with relative ease in and around Protara road, however, more extensive shopping and conveniences are a short 5-mile taxi ride north. Enjoy a relaxing stay in your room at Tsokkos Protaras Beach Hotel with modern conveniences such as wi-fi access, T.V., ensuite bathroom, fridge and more. As well as comfort and convenience, your room will be well-furnished with tasteful interior design, which is light and airy. Room options include land view overlooking the street or gardens or sea view which overlooks the Mediterranean Sea. Standard rooms come with double beds and sleep up to four guests. There is also a daily housekeeping service available so you can come back to a comfortable room every day of your stay. Tsokkos Protaras Beach Hotel provides a themed buffet restaurant serving breakfast, lunch and dinner as well as a cafeteria. Here you will find a great selection of international favourites in addition to local delicacies for a taste of fine Mediterranean cuisine. Restaurants in the area likewise cater to both tastes. A stroll down Protaras Road alone will see you presented with fresh Mediterranean seafood, classic Italian and great American burgers to name but a few. Visitors looking to stay out late will enjoy the many bars here, such as Waves Cocktail Bar with its wide and varied selection of drinks, which can be enjoyed whilst looking over the sparkling Mediterranean Sea. At Tsokkos Protaras Beach Hotel, guests will find plenty of ways to stay active or relax and take it easy. There is an onsite tennis court, games area and T.V. lounge as well as an outdoor swimming pool and a children’s paddling pool. There’s also great daytime and evening entertainments programme with live music, dancing, folkloric shows and much more, making for all-around fun family experiences. Other popular spots around Protaras are the Ocean Aquarium with lush tropical gardens, the unforgettable Magic Dancing Waters Live Show and the stunning Sunrise Beach where visitors can enjoy a range of fun water sports or simply chill out on the beach. Really enjoyed our stay here. We were not over happy with our room but were upgraded to a lovely pool view room with no quibble. Food we found was excellent. Despight complaints we read about on reviews of this hotel we found their was a huge choice of good of a very good Standard. 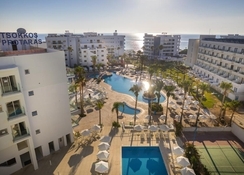 The room was excellent but the hotel a little tired in places especially corridors and lift areas but was informed hotel was due refurbishment before this summer. This hotel was nice. Entertainment average but better than none and we had fun. Most bar staff good and drink plentiful including large all inclusive cocktails. The day time entertainment was good eg yoga and kids club. Food was adequate.